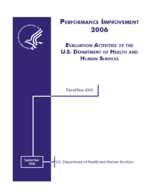 Child Welfare Outcomes 2002: Annual Report to Congress analyzes data on outcomes for children who come into contact with state child welfare systems. Analyses of state performance data suggest that many states are improving performance, particularly with regard to reducing maltreatment of children in foster care by foster parents or facility staff members, achieving permanency for children in foster care, and ensuring placement stability for children during the first 12 months that they are in foster care. However, many states experience challenges in reducing the incidence of maltreatment recurrence, as well as in finding permanent homes for children who have a diagnosed disability; children who enter foster care when they are adolescents; children who are African-American; and children who are Alaska Native/Native American. Many states are successful in reunifying children in a timely manner, but this success is tempered by the fact that rapid reunification tends to be positively correlated with re-entry into foster care. There was an increase in the number of States achieving adoptions within 24 months of a child’s entry into foster care. Efforts to achieve timely adoptions are often impeded by the reluctance of some judges and agency staff to seek termination of parental rights (TPR), and the lengthy legal procedures to achieve a TPR. Finally, variations in state performance may be influenced by state differences in demographics and other contextual factors.